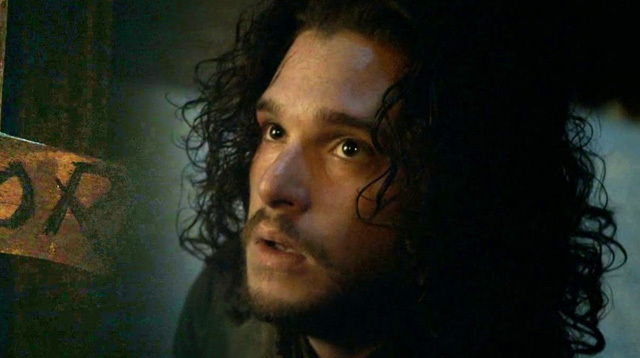 In case the title didn't give it away, this article contains a huge Game of Thrones spoiler—one that might answer your questions on the fate of a certain Jon Snow. Now, if you watched the end of season 5, you'll know that the last time we saw him, he was stabbed repeatedly, and left in a pool of his own blood (and snow) in the ground of Castle Black. Since Jon met his grisly end, those not ready to let go of his character have repeatedly said that he'll prolly make a return in season six. Now, the Daily Mail has obtained new photos of the actor who plays him, Kit Harington, on the Belfast set in his signature costume. Now, he could be filming flashbacks or appearing as a floppy-haired ghost in the new series, but how do we explain a recent admission by Kit on his role in the show? Despite HBO programming chief Michael Lombardo telling reporters in July that "everything [he's] seen, heard and read, Snow is dead," Kit told Belgian magazine Humo that he'd probably still be on the show in his thirties. He's currently 28. His exact words, when asked how many more seasons he's contracted to star in, were: "I can't talk about that. Let's just say that Game of Thrones will remain a part of my life for a while; I'll probably be in my 30s when it's over. One thing's for sure: the day I'm no longer on Thrones is the day I'll bury myself in movie projects [laughs]."